This article first appeared in Personal Wealth, The Edge Malaysia Weekly, on March 27 - April 2, 2017. Local funds that adhere to the environmental, social and corporate governance (ESG) criteria are performing well in both the conventional and shariah space. This has boosted investor confidence in such funds. VCAP Asset Managers Sdn Bhd CEO Shan Kamahl Mohammad says the proven track record of its Malaysian ESG Opportunity Fund, which was launched in July 2015, has helped warm up local investors to the idea of ESG investments. “It is normal for investors to want a targeted return to meet their financial goals such as preserving wealth, their children’s education and their retirement. The fund’s track record provides them with some comfort and they are more willing to look at ESG funds now. It also provides us with a stronger basis for launching more ESG products in the future,” he says. The Malaysian ESG Opportunity Fund is the first of its kind to invest in only local stocks. The fund saw a net return of 17.96% over the one-year period ended March 10. This compares with the Lipper Equity Malaysia category’s average return of 7.44% during the period. VCAP is a subsidiary of ValueCAP Sdn Bhd, an investment holding company owned by Khazanah Nasional Bhd, Permodalan Nasional Bhd and Kumpulan Wang Persaraan (Diperbadankan). Performance remains the key to attracting investor interest in ESG funds, says BIMB Investment Management Bhd CEO Najmuddin Mohd Lutfi. The company’s BIMB-Arabesque i Global Dividend Fund 1 saw a total return of 20.73% (excluding fees and charges) over the one-year period ended March 10. This was higher than the Lipper Equity Global category’s average return of 18.86% during the period. The fund was the first shariah-compliant ESG fund launched in Asean. “The average returns of conventional funds are generally higher than their shariah-compliant peers. So, to attract investor interest, we benchmark our performance against conventional funds rather than shariah funds,” says Najmuddin. For now, ESG investments in the country are mainly by institutional investors, he says. “This has to be a top-down initiative. The government and financial institutions are pushing for it, so it is only a matter of time before the trend takes off among retail investors. “Malaysia as a whole has made inroads in this sphere. Larger institutions such as the Employees Provident Fund have championed the space via direct investments and by outsourcing ESG mandates to other fund managers. The traction is stronger in the institutional space. But over time, more retail investors will come on board. The launch of the Islamic Fund and Wealth Management Blueprint by the Securities Commission Malaysia at the beginning of the year will be another catalyst for growing sustainable investments. That is because shariah and ESG investments share commonalities in their screening process. Thus, the uptake of shariah funds will also help ESG investments grow. “In fact, local shariah-compliant funds are beginning to incorporate ESG factors to appeal to the shariah-agnostic investors globally,” says Najmuddin. Globally, more institutional investors are adopting socially responsible and ESG investments in their search for returns. The Global Sustainable Investment Alliance says the global market for sustainable investments rose 61% to US$21.4 trillion in 2014 from 2012. Many of the funds that practise sustainable investing are sold in the US, Canada and Europe. International index provider Morningstar recently launched sustainability indices in different regions and countries around the world, prompting more investors to explore this segment. The Malaysian ESG Opportunity Fund invests in 42 companies on the FTSE4Good Bursa Malaysia Index (as at December 2016). The wholesale fund has a minimum investment amount of RM250,000. There is an annual management fee of 0.45% but no sales charge. The fund has seen its assets under management grow to RM240 million in the 1½ years since it was launched. “I expect the fund size to grow over the next two years due to its potential for generating good sustainable returns over the medium term for ringgit-based investors,” says VCAP’ Shan. The BIMB-Arabesque i Global Dividend Fund 1 invests in companies around the world that adhere to the Accounting and Auditing Organisation for Islamic Financial Institutions’ shariah standards and the United Nations Principles for Responsible Investment. The wholesale fund carries a minimum investment amount of RM30,000 and imposes an annual management fee of 1.8% and sales charge of up to 5%. The fund has amassed an AUM of RM68 million since November 2015. “It is the second largest global shariah equity fund in Malaysia,” says BIMB’s Najmuddin. These fund houses have carved out a niche for themselves in the asset management industry with sustainable investing and are planning to build on the momentum and come up with more investment products. VCAP launched its Asean 5 ESG Opportunity Fund in January, allowing investors to tap ESG investments in the Philippines, Thailand, Singapore and Indonesia, while BIMB launched its BIMB-Arabesque Malaysia Shariah-ESG Equity Fund in March. 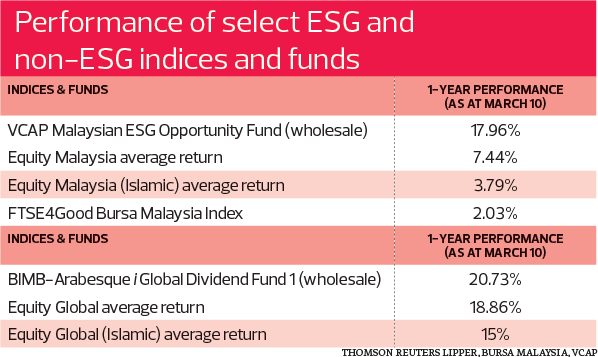 More ESG funds (both conventional and shariah-compliant) are expected to come into the market. It is possible that the first ESG bond fund will be available to local investors in the next 12 months, says Shan. “It is in our pipeline. However, our focus now is to continue growing our two equity funds and establish better track records,” he adds. On the global front, there have been discussions about US President Donald Trump’s plan to sign executive orders that will put an end to the Obama administration’s Climate Action Plan and Clean Power Plan. The Washington Post reported that “Trump is preparing executive orders aimed at curtailing Obama-era policies on climate change and water pollution”. If Trump follows through on this, many will view him as the one who set environmental, social and corporate governance-related investments back as companies are expected to place less importance on ESG issues. News reports have pointed out the possibility of funds moving from the ESG space into non-ESG sectors that stand to gain from Trump’s economic and administrative policies, such as oil and gas, mining and defence. If Trump’s plan is implemented, it will only be a small setback for the global ESG industry, even though the US is an important player on the sustainability front, says Anthony Serhan, managing director of Asia-Pacific research strategy at Morningstar. That is because European countries will continue to focus on sustainable investments and there is growing momentum from Asia. “Even in the US, some of the state governments have the power to carry out their own ESG policies [regardless of the federal government’s decision]. A lot of rules and regulations at the state level will continue being pro-ESG and sustainability,” he says. Serhan says there have been no significant fund outflows in the ESG mutual fund space in the US. On the contrary, there were more ESG-related exchange-traded funds launched last year. Of the US$22 trillion global ESG investments last year, only a fraction came from Asia, he says. However, the trend is slowly picking up in more developed countries such as Japan and South Korea. “It is still early days in Asia compared with Europe and the US. But the trend is coming,” says Serhan. Social issues such as air pollution in developing countries will prompt Asian investors to be more ESG-conscious in the long run and make changes to their investment decisions. Malaysia is one of the countries that are expected to adopt this trend. “Malaysian investors are quite receptive to sustainable investments due to shariah principles, which have traits similar to ESG investments,” says Serhan.